service. Get a better deal with HSS Stena Line. UK, Ireland, Holland, Scotland and Wales offering fast connections for both leisure and business customers. 17 ferry routes HSS Stena Line operate online using the drop down menu above. HSS Stena Line web site. HSS Stena Line was founded by Swede Sten Allan Olsson in 1962, and is now one of the world's biggest and busiest ferry operators. The traffic statistics of over 17 million passengers (translating to 3.2 million vehicles) travelling with HSS Stena Line in 2004 certainly qualify this. 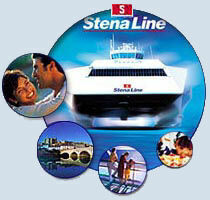 HSS Stena Line now operates four routes in the UK, after aquiring Sealink British Ferries in 1990. The HSS Stena Explorer made her maiden voyage on the Holyhead - Dun Laoghaire route on 10th April 1996, offering what is considered by many as an unparalleled level of service on ferries to Ireland. Traveling with HSS Stena Line across the sea is a perfect way to travel, from the moment you drive or walk onto the ferry, to when you wave goodbye to the mainland, to when you arrive at your destination port, you will travel in a first class environment. Onboard HSS Stena Line ferries you can relax and enjoy good food, shop at a fine selection of retailers, enjoy the bracing sea air and the lifestyle of an ocean voyage, whilst planning your next steps in the country of your destination. HSS Stena Line has a vast network that covers the Irish Sea - bridging both England and Scotland to Ireland, and also the North Sea routes to Scandinavian countries to the North and East. The phrase Making Good Time summarises the core of the HSS Stena Line business in three words: fast ferries, enjoyable and efficient sea travel. For us and our guests onboard, travel is more than just getting from A to B; it's also about taking a break from daily routines and having a good time. HSS Stena Line guarantees an enjoyable trip where the time onboard can be used to relax, spend time together, or eat well. Travelling with HSS Stena Line should be good value, uncomplicated and stress free. Put simply, the travel alternative that beats the rest. Today's ferry customers are looking for more. Basic factors such as punctuality, safety, clean and well-equipped ferries with good service are now taken for granted, so at HSS Stena Line we're trying even harder to give guests that little extra so they'll want to travel with us again. A way of meeting these new demands is to develop new products and services, and to further customise our offers to suit different requirements. Our ambition is that everyone should find a travel offer in our selection that they like. Today it's important that travel and tickets can be booked quickly and simply, whenever and however the customer wants. HSS Stena Line's guests can book trips at any time of the day or night, via telephone, Internet or travel agencies. HSS Stena Line annually arranges around 500,000 holiday trips in Ireland, Great Britain, Germany, Poland, Belgium, Holland and Scandinavia. Our range includes everything from pure transport trips to package tours with accommodation and activities included, entertainment cruises and conference trips. Regardless of the type of trip the customer is making, the ferry crossing provides added value through the activities and entertainment offered onboard. One of the latest trends within tourism is that people are choosing to travel more frequently but to destinations closer to home. Taking their own car with them to the destination is also something that attracts many. HSS Stena Line is thus investing heavily in flexible package tours, additional departures and in car transport. British and Irish passengers travel often to each other's countries and, in the British and Irish market, straight transport is the most important product. A great many Dutch travel to Great Britain, primarily to London, and Amsterdam is a relatively popular destination for British travellers. Denmark, Zealand and Northern Jutland, are the favourite destinations for Swedes. In Denmark, HSS Stena Line is the largest arranger of skiing trips to the Swedish and Norwegian mountains. Germany attracts many Scandinavians every year and many Germans enjoy spending their holidays in Sweden. Poland, with fascinating old towns like Gdynia and Gdansk, attracts many Swedes, and Poles are keen to visit Scandinavian destinations. On the freight side HSS Stena Line is working hard to offer customers what they want: a comprehensive route network, good service onboard, effective Internet and telephone booking, and competitive prices. To make the most of all possible synergy effects on our different routes and within our various geographic areas, HSS Stena Line has divided its operation into four business areas: Scandinavia, the North Sea, the Irish Sea and Freight. HSS Stena Line started originally with passenger traffic between Göteborg and Denmark , and these routes still form the backbone of the business with more than 2 million passengers per year. HSS Stena Line is market leader on the routes between Sweden and Denmark . Transport passengers (private customers with car) are our main business, but there is also strong interest in cruises and package tours to Denmark . A considerable amount of freight transport is also handled. HSS Stena Line's most popular route to Germany is Göteborg-Kiel, a route for passengers and freight that has operated since 1967. During the days of duty-free, the Göteborg-Kiel route was also a popular entertainment cruise. Today, transport passengers form the most important segment on this route. However, investments are also being made in conference and entertainment cruises. Göteborg-Travemünde is purely a freight route. The routes between Trelleborg and Germany are run under the management of Scandlines AB and attract both freight and private customers. The Oslo-Frederikshavn service was started in 1979, and is one of HSS Stena Line's oldest routes. More than 70 per cent of guests onboard are Norwegians. The main product on this route is cruises with themes and onboard concepts that are customised to different passenger groups. Typical examples are dance band, hip-hop, student cruises and quiz weekends. Other product groups are transport/package, conference and freight. HSS Stena Line's route between Karlskrona and Gdynia has expanded strongly during recent years and interest is steadily growing among private and freight customers in both Sweden and Poland . HSS Stena Line started operating between Karlskrona-Gdynia in 1995 through its subsidiary Lion Ferry, but has operated under the HSS Stena Line name since 1998. HSS Stena Line is market leader in package tours between the two countries, with bus and group travel forming a large target group. Within the North Sea business area, HSS Stena Line operates the routes Hoek van Holland-Harwich, Hoek van Holland-Killingsholme and Rotterdam-Harwich. HSS Stena Line's routes on the Irish Sea are Stranraer-Belfast, Holyhead-Dublin, Holyhead-Dun Laoghaire, Fishguard-Rosslare and Fleetwood-Larne. Routes on the Irish Sea include private travel and freight, with a high proportion of customers travelling several times per year. HSS Stena Line is the largest ferry operator on the Irish Sea with over 3 million passengers travelling on our routes every year. The Freight business area includes all routes used by HSS Stena Line's freight customers. Booking centres throughout Europe sell transportation on all HSS Stena Line routes via a common booking system. Foot and car passengers should check-in a minimum of 30 minutes prior to departure. 1 hour for Harwich ferries other than HSS. Of course. All ports that HSS Stena Line travel from offer parking facilities onsite, or very nearby. There is usually a charge for parking, so please inquire before you travel and arrive prepared: See port information pages on the HSS Stena Line website for details. Yes you will if you are traveling to most countries. Passengers who are traveling to Northern Ireland or the Republic of Ireland are advised to take a form of identity; a passport is just one of the accepted forms: others include driving licenses. Are there any limits to the amount of luggage I can take on HSS Stena Line Ferries? Day trip travelers on HSS Stena Line and other operators are restricted to one piece of hand luggage, and advised not to exceed that limit for any reason. Foot and rail passengers who are traveling for longer than 24 hours are permitted to take only two items of luggage in addition to their allotted hand luggage. For passenger safety reasons HSS Stena Line allow only hand luggage on any of the passenger decks on the HSS Stena Lynx and HSS Stena HSS. Passengers' baggage must be strictly stowed away during the crossing. Do children pay to travel on HSS Stena Line Ferries? All children under the age of 4 travel free on HSS Stena Line Ferries. Children over 4 years but under the age of 16 travel at the same rates as adults. There is, however, a reduction on adult fares if traveling by foot. Are there facilities for children onboard HSS Stena Line Ferries? On board all of HSS Stena Line's ships you will find Baby Changing facilities and children's menus in the restaurants. HSS Stena Line - HSS 1500 Explorer - Playroom and a children's cinema. Children's entertainers onboard selected sailings during summer holidays. HSS Stena Line - Superferry K. Beatrix - Creche on selected sailings only and a playroom. HSS Stena Line - HSS 1500 Voyager, Superferry Galloway & Superferry Caledonia - all have a playroom available for children. Children's entertainment is available at weekends and during school holidays on the HSS 1500 Voyager. HSS Stena Line - HSS 1500 Discovery - has a playroom and also children's entertainment at weekends and during school holidays. It is best to phone ahead to remove any uncertainty regarding your travel arrangements. Please let HSS Stena Line know in advance on 08705 70 70 70 so HSS Stena Line can make arrangements for your travel. Are there places to eat and drink onboard HSS Stena Line? Yes. All HSS Stena Line ships offer at least one restaurant, bar and lounge area for the enjoyment of their customers. See onboard information pages from the HSS Stena Line website for facilities specific to each route and ship you are traveling on. Where can I buy tickets for HSS Stena Line? Use the booking engine to search for HSS Stena Line tickets, and enjoy this excellent operator's facilities to travel across the seas in style and luxury. To find out more about your destination simply click on your chosen ferry route. Find hotel and resort accommodation at discount prices using our fast secure price check facility. Compare all ferry ticket prices for any given day then select the cheapest available fare and book your ferry ticket online. Book your HSS Stena Line group and coach travel party ferry tickets to or from the UK, Ireland and Holland online in advance to benefit from HSS Stena's exclusive online special offers of up to 40% off standard brochure fares on all ferries. Book your HSS Stena Line ferry tickets to or from the UK, Ireland and Holland online in advance to benefit from HSS Stena's exclusive online special offers of up to 40% off standard brochure fares on all ferries. Book your HSS Stena Line short break or holiday exclusive online and enjoy special offers of up to 40% off standard brochure fares on all ferries. Information on Belfast to Stranraer Ferries and booking of ferry crossings from Belfast to Stranraer with all major ferry operators. Information on Dublin to Holyhead Ferries and booking of ferry crossings from Dublin to Holyhead Irish Ferries with all major ferry operators. Information on Dun Laoghaire Holyhead Ferries and booking of ferry crossings from Dun Laoghaire to Holyhead with all major ferry operators. Information on Fishguard Rosslare Ferries and booking ferry crossings from Fishguard to Rosslare with all major ferry operators. Information on Harwich Hook of Holland Ferries and booking Ferry Crossings from Harwich to Hook of Holland with all major ferry operators. Information on Hook of Holland Harwich Ferries and booking ferry crossings from Hook of Holland to Harwich with all major ferry operators. Information on Holyhead Dublin Ferries and booking Ferry Crossings from Holyhead to Dublin with all major ferry operators. Information on Holyhead Dun Laoghaire Ferries and booking ferry crossings from Holyhead to Dun Laoghaire with all major ferry operators. Information on Larne Fleetwood Ferries and booking of ferry crossings from Larne to Fleetwood with all major ferry operators. Information on Rosslare Fishguard Ferries and booking ferry crossings from Rosslare to Fishguard with all major ferry operators. Information on Stranraer Belfast Ferries and booking ferry crossings from Stranraer to Belfast with all major ferry operators. The best prices for Fast Ferry and Ferry Travel to Ireland, Holland and Britain. Book your HSS Stena Line ferry tickets to or from the UK, Ireland and Holland online in advance to benefit from HSS Stena's exclusive online special offers of up to 40% off standard brochure fares on all ferries.